Wonder what these leaves are saying? If you're interested in learning more about tassography but want to learn it for free, tea leaf readings aren't hard to do on your own. You simply need to decipher the meaning of the leaves left in your cup. The process is simple: drink some tea and figure out what the pattern indicates. After all, symbols are important in most forms of divination. However, there's much more to it than having a cup of tea. The best way to do a tea leaf reading is for yourself in a relaxed environment, but there are even simulators available on the Internet and plenty of guides to help you on your way. Keep reading to learn more about free Internet sources for tea leaf readings. If you're not satisfied with free tea leaf readings on the Internet or just want more accurate readings, you can learn to read tea leaves yourself! The experience is rewarding, fun and who knows--you might want to start reading tea leaves for free for your friends and family! The first step in reading your own tea leaves is to be brew a loose tea. You can't use tea in a bag, as there will be no tea leaves at the bottom of the cup! Be sure to use a light colored cup or mug and to choose the widest cup possible (this will give you the room to distinctly see patterns and shapes). The second step is to drink your tea. Many suggest it is best to try and a think of a particular question or life area. When you are done with your tea, leave a small amount of liquid to help the leaves stick. 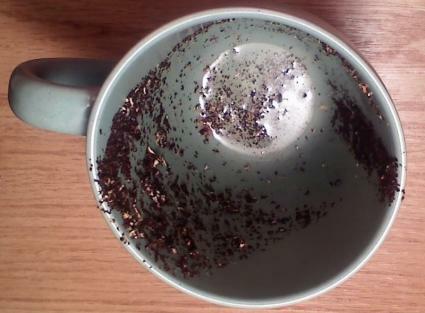 The third step in reading your own tea leaves is perhaps the most important. Some readers suggest that you drink the tea ,and then just leave the cup in the position where you put it down. Others suggest that there is value in where the handle of the cup (if applicable) faces. However, a more common school of thought is to hold the cup in your hand and vigorously swirl the cup in a circle three times. Whichever method you prefer is up to you. At this point, all that is left is to look at the bottom of your cup and see which patterns or shapes you see. It's best to consult an Internet or book source to find out what your shapes indicate. Tea Leaf Readings and Meanings features a list of some of the most common images found in teacups with short statements of their meanings. This is a great source for a beginner looking to start off easily. Crystallinks.com features a similar list of common symbols and shorter meanings. Serenapower.com is another great site featuring both tips on reading your own tea leaves plus a meaning and symbol guide. The site also features information on other divination methods such as tarot. Tasseography.com features a full photo guide on how to read tea leaves and other methods. Project Guttenberg features a book for download by Highland Seer entitled Teacup Reading and Fortune Telling by Tea Leaves is a great work of interest to anyone interested in advancing their knowledge in tea leaf divination. Free tea leaf readings are a wonderful thing to find. You can also find them in your area by visiting your local psychic or tarot reader. Many are more than willing to do tea leaf readings (if they're qualified to) for little or no cost if you pay for one of their other readings. You may also find that someone among your friends might have a gift for reading leaves. Look around and remember that if all else fails, you can always find tips on the Internet.